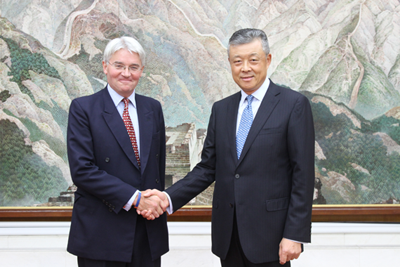 On October 11, 2017, Ambassador Liu Xiaoming met with Andrew Mitchell, Member of Parliament and former Secretary of State for International Development and exchanged views with his guest on China-UK relations, foreign aid policy and issues of common concern. Ambassador Liu noted that this year marks the 45th anniversary of China-UK ambassadorial relations, and it is also a year for consolidating the "Golden Era" of China-UK ties. China and Britain have frequent high-level exchanges, fruitful outcomes in practical cooperation and close communication and coordination on international issues. While the current international and regional situations are undergoing profound and complex changes, China and the UK need to work together to further deepen the strategic mutual trust and cooperation in global governance and international development to make China-UK "Golden Era" strong and enduring so as to deliver more to the two countries and the peoples. Mr. Mitchell spoke highly of China-UK relations, saying that in the time of rising global protectionism, Britain and China have found increasing consensus on global issues and growing common interests. The two countries should further strengthen cooperation in international development and other fields. He is willing to continue to play a positive role in deepening communication between parliaments and parties of the two countries and in helping to consolidate China-UK "Golden Era".